The crocuses lied to us all. During the week we had some beautiful sunny days and it really felt like we were marching forward to spring. Instead, we were vaulted back to the depths of winter today with a morning of wet snow. 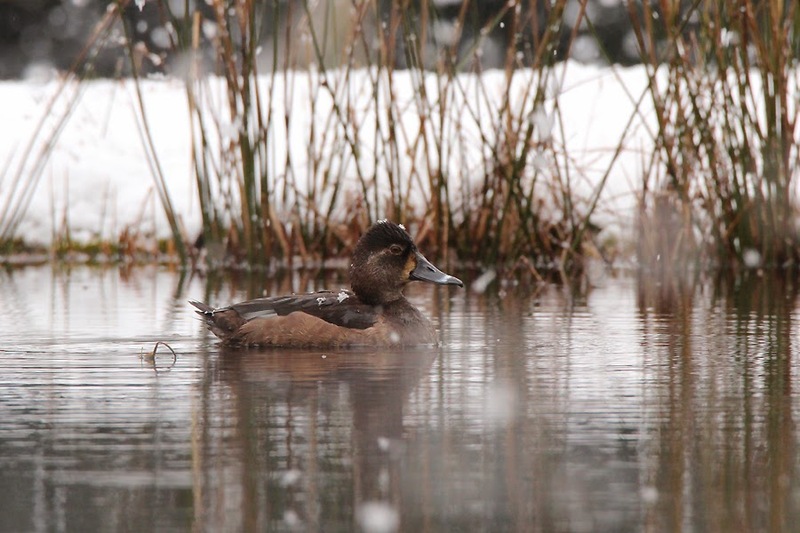 No, this female Ring-necked Duck does not have dandruff. It snowed and snowed this morning! I waited for the snow to slow down a little before heading out for a few hours of birding. The first order of business was to check over Maber Flats from the east end because the ducks were all concentrated there a week ago and I wasn't able to scan through them. From the end of Meadowbank Rd., I looked down over a large group of Green-winged Teals in hopes of at least finding a Common Teal. I must have passed over the flock two times before a candidate popped out. I initially thought there was a chance the bird was a hybrid because I saw the slightest trace of a vertical white bar that is typical of a Green-winged Teal. I think this can be shown on Common Teal, so I believe it is likely is a Common Teal. I will, however, try to get back down to the flats in the next couple weeks to give it a better analysis. If you happen to be birding on the Saanich Peninsula, go check it out and let me know what you think! After checking the flats, I wanted to head over to Hovey Rd. to see if there was a blackbird flock around. Before I made it Hovey, I found myself pulling off to the side of Tomlinson Rd. 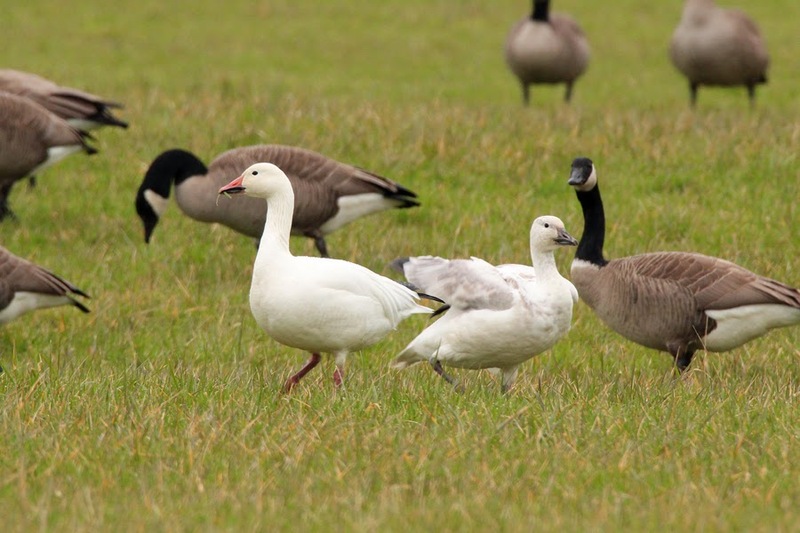 because three white geese were in a field among the regular flock of Canada Geese. They appear to be the same group of three - one adult and two juveniles - that was at Martindale Flats last weekend. It appears that snow can strike twice in a day - take that lightning! The adult Snow Goose with one of the two juveniles, seen along Tomlinson Rd. I finished my day off out at Patricia Bay. When I was there last weekend, as you might recall, the tide was high, it was raining, and ducks were just offshore. By the afternoon today, the temperature rose a couple degrees and it was raining again. The difference, however, was the tide, which was quite low when I rolled up at around 3:30 p.m. When the tide is low at Patricia Bay it can be quite productive for gulls near the outflow of Wsikem Creek. I pulled off the road and scanned out over the gulls and immediately noticed a dark-backed individual. 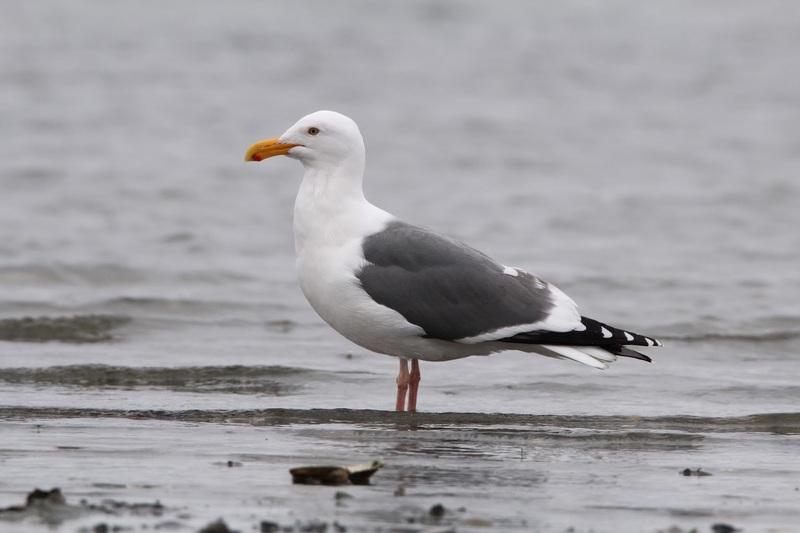 The gull had a clean white head, yellow-orange bill, and slate-grey mantle. It was a picture perfect Western Gull! This is the kind of bird that reminds you what a Western should look like. When you only see the ones at Clover Point and Esquimalt Lagoon, you kind of lose track of what a good Western looks like. I'm not saying there is never a proper Western at those spots, but there are a number of convincing hybrids and birds that are not quite as classic as you'd hope. I was eager to get out and try to get some photos of the Western at Patricia Bay, so I trudged my way out across the shore until I got close enough for some shots. 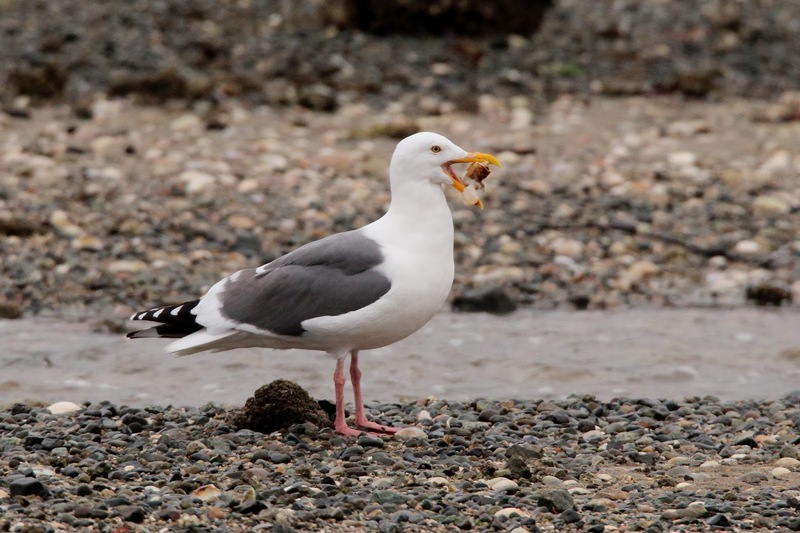 The bird turned out to be quite cooperative as it feasted on clams and scrapped for prime shoreline real estate with the other gulls. 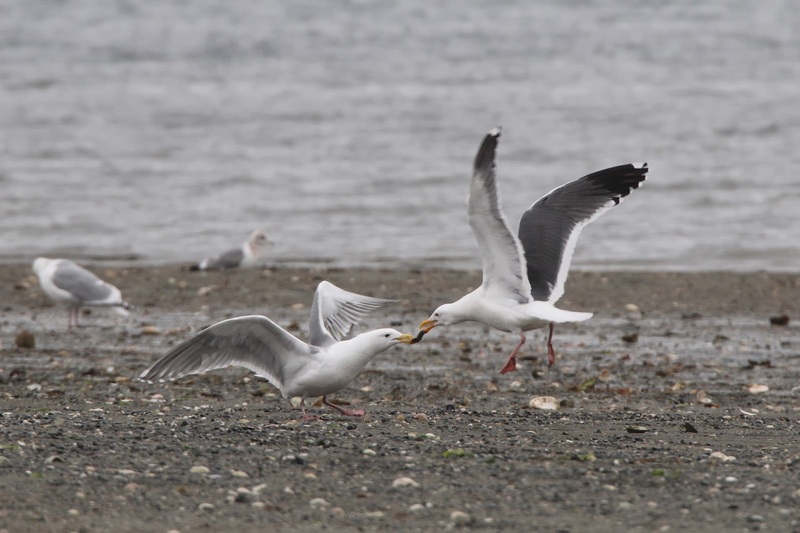 I also had a handful of Thayer's and Mew Gulls, but only a couple of the Thayer's were close enough for a photo. 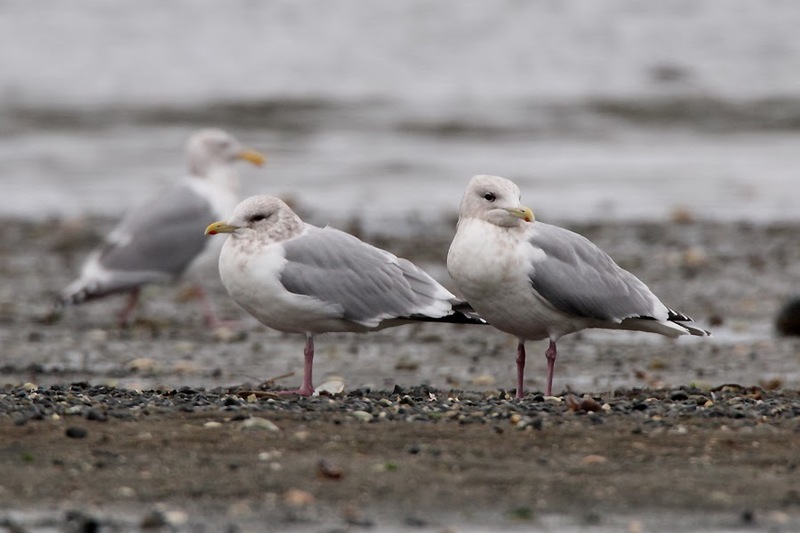 For me, the amber eyes, straw-coloured base to a somewhat short bill, streaked head, medium grey mantle, and bubblegum pink legs are the key features of a Thayer's Gull. Even with the poor weather, the birds put on a good show today. 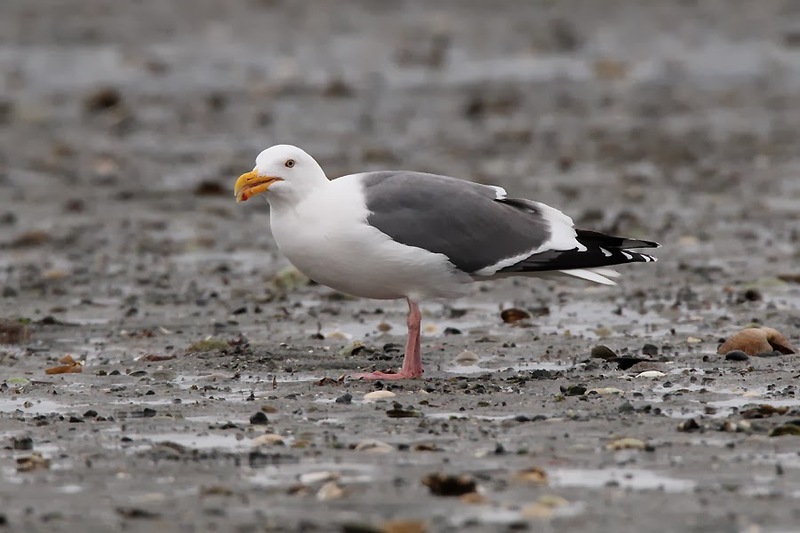 I think photos of bona fide Western Gulls are worth their weight in gold in the Pacific Northwest where "Olympic" Gulls - that's one name applied to Glaucous-winged x Westerns - are so prevalent. And let's not forget that double snow action - good day!